To the extent that genes play a role, IQ will vary by racial admixture. In the past, studies that have attempted to test this hypothesis have had no accurate way to measure the degree of admixture, and the results have been accordingly muddy. The recent advances in using genetic markers solve that problem. Take a large sample of racially diverse people, give them a good IQ test, and then use genetic markers to create a variable that no longer classifies people as ‘white’ or ‘black,’ but along a continuum. Analyze the variation in IQ scores according to that continuum. The results would be close to dispositive. Murray believed such a project would only project scientific legitimacy if the participating researchers had diverse beliefs about the causes of the black-white IQ gap. But when he attempted to assemble the team, with assurances that he himself would find the funding, only the hereditarian researchers wanted to contribute to the project. So it did not happen. We already have data showing that African Americans with more European admixture have more education and higher paying jobs. But even if we didn’t have this admixture data, we already knew from more basic social data that lighter skinned and biracial African-Americans have better social outcomes (including higher IQ scores, which largely mediate the other outcomes). Further, genetic data is open to the same fundamental differences in interpretation. Do blacks with more European admixture have higher IQs because they have more high IQ genes, or did their parents and wider society give them more IQ-boosting advantages because of their relatively European appearance? Or perhaps blacks with more white ancestry simply inherited greater amounts of cultural and material resources from their white ancestors. We might wonder then, if this problem is intractable. Blacks with more white ancestry, and thus more hypothetical IQ-boosting variants, will also always look more European; and this implies that, even if the hereditarian hypothesis was true, we could never really falsify the theory that black-white IQ differences are caused by some unknown disadvantage that is triggered by racial appearance. Perhaps the hereditarian hypothesis can only receive a strong confirmation—possibly much further down the road—when the genetic architecture of intelligence is more fully understood, and IQ scores can be predicted from genome content alone. A recent innovative solution to an analogous problem in behavior genetics offers one kind of hope that this is not the case. Do inherited differences contribute to the large individual differences in traits like height or intelligence? Behavior geneticists have long answered this question with heritability: the proportion of measured phenotypic variance that is accounted for by shared genetic kinship. The most convincing human heritability estimates were determined by the correlation of traits among genetic relatives with little to no social proximity: for example, the resemblance between adopted-away children and their biological parents, or between twin pairs raised by different families. However, these are rare family arrangements, and many heritability estimates from these gold standard samples were not even published until the 1990s (Bouchard et al., 1990; Loehlin et al., 1997). Most heritability estimates were (and still are) calculated from common family arrangements: e.g. the IQ similarity of full siblings compared with half siblings; or of identical twins compared with fraternal twins. Critics of behavior genetics have long exaggerated the potential vulnerabilities of these various methods of determining heritability (and ignored the body of empirical refutations): The correlation between adopted-away children and their biological parents might be caused by selective placement, where adoption agencies place the children with parents that are similar to their biological parents. The correlation between twins raised apart might be explained by any reported contact between the twins at any age, or by their shared biological experiences in the womb. And, of course, epigenetics has become something of a final refuge for the committed genephobe. Potential weaknesses in heritability from common kinship estimates are somewhat more plausible: Perhaps identical twins are more similar than fraternal twins because they are treated more similarly, or because they have a deeper bond, and not because they share more genes. Heritability estimates rely on a so-called Equal Environment Assumption (EEA), that differential family resemblance is due to genetic similarity, and not to environmental similarity mediated by kinship. Behavior geneticists have assembled various kinds of evidence in support of this assumption. The strongest empirical evidence in support of the EEA uses twins with misidentified zygosity (i.e. the relative trait similarity of fraternal twins who mistakenly believe they are identical twins and vice versa). For example, IQ scores are not more similar among fraternal twins that are mistakenly raised as identical twins (Scarr et al., 1979; Matheny 1979). This is a fairly low-tech behavior genetic solution to the EEA problem, and there is an analogous solution to the admixture problem. The original report from the Minnesota Transracial Adoption Study by Scarr and Weinberg (1976) showed that the transracially adopted children with one black parent scored 12 points higher on IQ tests than the transracially adopted children with two black parents. Scarr asked whether this could be due to an “Expectancy Effect,” that is if the biracial children scored higher on the tests because their white adoptive parents treated them differently. She tested this idea by looking at the children with misidentified racial background. Twelve of the biracial children were mistakenly believed to have two black parents. These biracial children nevertheless had the same higher IQ scores as the biracial children with correctly identified racial background (pp. 732-733). These methods are a similar solution to a similar problem. Large differences between identical twins and fraternal twins can logically be due to differential genetic similarity or due to differential environments created by those identities (either based on how the twin-pairs perceive themselves or how their parents or society perceive them). But if the latter is true, we should see the opposite results where those perceptions are reversed. Fraternal twins viewed as identical twins by themselves, their parents, and others, should be just as similar as identical twins. Likewise, large differences between blacks and biracial blacks can logically be due to differential inherited intelligence or due to differential environments created by those racial identities. But if the latter is true, we should see the opposite results where those perceptions are reversed. Blacks viewed as biracial by themselves, their parents, or others, should develop IQ scores like biracial blacks. These are small studies, however, and they rely on rare groups (misidentified twins and transracially adopted blacks). A more recent study (Visscher et al., 2006) shows that heritability can be estimated with normal siblings, and more importantly, without assumptions about the environment at all. And while it couldn’t resolve the admixture dilemma in the exact same way, similar methods could provide strong evidence for genetic racial differences. How can you estimate heritability from full siblings without any assumptions about the environment? More typically we could determine heritability by comparing the trait correlations between full siblings (who share 50% of their genes) and half siblings (who share 25% of their genes), and chalk up any differences to heredity, by assuming these sibling pairs otherwise occupy similar environments when raised together in the same household. We can go some way, empirically, to show this assumption is true. But at the end of the day, half siblings know they are half siblings, and full siblings know they are full siblings. It is not a blind experiment. The Visscher paper, on the other hand, exploits a little known fact: full siblings share 50% of their genes, ON AVERAGE. The randomness of genetic segregation and recombination creates variation in the fraction of identical-by-descent genes shared by full siblings; or, phrased more explicitly: full siblings typically differ in their genetic relatedness. 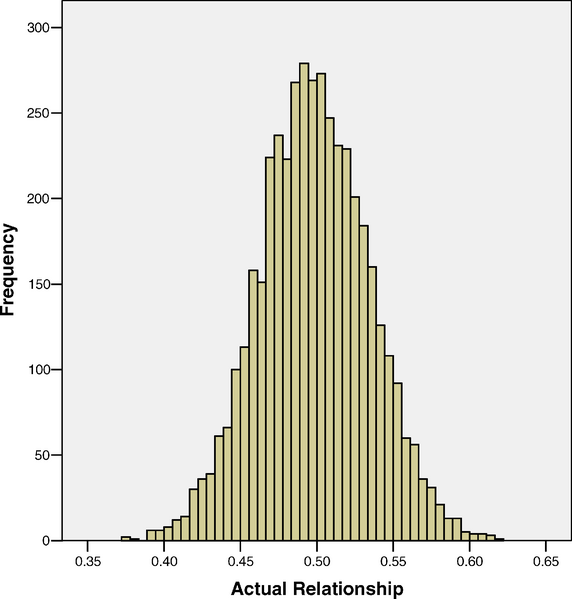 In this sample of over 3000 full sibling pairs, Visscher finds that siblings share 50% of their genes, on average, with a standard deviation close to 4%, and a range between 37% and 62%. Any systematic phenotypic differences between differentially related full siblings are purely genetic effects; and, in this paper, Visscher finds that most of the variation in height was explained by genetic similarity, just as it always was in classical heritability studies. This exact method has not yet been applied to IQ, but Visscher and a team of other researchers have calculated the heritability of IQ with a similar method, using genome-wide autosomal similarities among large numbers of unrelated strangers (Davies et al., 2011; see also Plomin et al., 2013). Within-family comparisons provide a wealth of mostly unexploited opportunities to test theories about racial differences in socially valued outcomes. My co-bloggers, for example, have shown that differences in skin color among blacks correlate with IQ between families, but not among full siblings, suggesting (among other things) that social discrimination models are not robust explanations of these differences. Widely promoted ideas that maternal cultural transmission or early home language use underlie racial cognitive gaps can potentially be tested by looking at single white mothers who have both white and biracial children. Any differences between these children would create additional (though roundly ignored) problems for the half-hearted environmental theories currently circulating. Some of the better quantitative sociologists have used within-family designs in Brazil. In his illuminating book, Race in Another America, sociologist Edward E. Telles compares mixed race children in Brazilian families who are alternately classified as white and non-white by their parents. The non-white siblings are more likely to have academic problems and to repeat grades at school (pp 148-150). A similar Brazilian study by Marcos A. Rangel, found that light-skinned siblings are more likely to be enrolled in school and attend higher quality schools than their dark-skinned full siblings. Both authors use this finding as evidence for parental discrimination against their darker children, yet neither one questions whether the whiter siblings genuinely exhibited higher academic ability. (My co-bloggers, for example, find that skin-color differences in educational outcomes among blacks are completely explained by prior IQ differences). A related question is whether these lighter-skinned, more academically adept, full siblings, actually had more white admixture, and this is where the Visscher study is potentially relevant to the greater Admixture Problem: Mixed race full siblings differ from each other slightly in their proportions of racial admixture, for the same exact reason that full siblings differ slightly in their relatedness more generally. And just as full sibling pairs with greater genetic similarity show greater phenotypic similarity, full sibling pairs with more similar racial admixture should show greater phenotypic similarity in traits like IQ (if traits like IQ do, in fact, vary with racial ancestry). A Mixed-Race Full-Sibling Admixture Study would have key advantages over a general admixture study, like the ones linked at the beginning of this post. First of all, blacks with greater amounts of white admixture in the general population could have also inherited more cultural and material advantages from their white ancestors, and this will confound historical effects with possible genetic effects. These between-family effects would be equalized within families. Second, the smaller differences in ancestry between full siblings should leave only minor differences in the racial distinctiveness of their facial features. The siblings could be classified according to their measured skin color and perceived racial appearance, and this could be combined with the mostly cryptic admixture data to falsify either socially mediated or hereditary theories of any resulting differences. Since pigmentation is controlled by a much smaller number of genes than other appearance traits, and yet plays a much larger role in racial perceptions, some siblings will be socially perceived as more African, even though they have a higher proportion of European admixture than their lighter skinned siblings. If these children also have higher IQ scores, then there is no more question if genes are implicated in the racial difference. The proof is final. kind of. The feasibility of a study like this is another matter entirely. It’s implausible that a sample of mixed race children as large as the sample in the Visscher study could or will be assembled specifically to test an idea that very few scientists want to test. It’s possible that sibling data like this might be found in existing or future social surveys (e.g. The National Children’s Study alleges it will collect genetic data from some 100,000 families) [Edited: this dataset got cancelled.]. But these hypothetical datasets might not even have IQ tests and wouldn’t have questions as obviously tailored to disentangle genetic and social effects (e.g. “perceived racial admixture”). A common skin-tone rating variable would probably accomplish much the same thing, if most perceived admixture is, in fact, a function of skin color (this is plausible, but I don’t actually know if it is true). Another possibility: Over 2,500 black adolescents consented to DNA archiving in the Add Health survey; this might include some sufficient number of sibling pairs. Unfortunately, the biological samples have only been genotyped for a small handful of candidate polymorphisms. Presumably, the Add Health Guardians could choose to fully genotype their stored samples in the future, but this is not yet on the table. The upside to this is that the technology currently exists to fully resolve questions about genes, race, and IQ. The downside is that it would take lots of effort, money, and cooperation to assemble the right kind of experiment, and the necessary will simply does not exist to perform these kinds of experiments. Hereditarians will have to continue weaving together broad inductive arguments from imperfect data, as the post genomic era will not be offering up strong proofs on a silver platter any time soon. But if the genetic hypothesis is true, it can only look more convincing over time. I believe it looks more probable now than it did 20 years ago, even though many of the most persuasive arguments were actually articulated by Arthur Jensen over 40 years ago. This post discusses the expected differences in IQ between differently colored black siblings in an additive genetic model of race differences, while the colorism posts are predicated on an expected lack of IQ differences between differently colored black siblings in an additive genetic model of race differences. Contradiction? The significance of this family study design is that hereditarian theory predicts that skin color will be substantially associated with IQ between families, but not within families. That is, if we have two African American siblings the darker one should be approximately as likely as the lighter one to be the smarter of the two. This is because skin color is controlled by a handful of genes, scattered across different chromosomes, and each (full biological) sibling is equally likely to inherit any variant. Skin color cannot be used as a proxy for ancestry when comparing siblings. I believe that these assumptions are reasonable and adequate for the analyses being done on these datasets. And the simple fact that they did not find within family IQ correlations only reinforces the soundness of these assumptions. Hereditarian theory does predict certain, small color-IQ correlations within families because of differential racial ancestry between full siblings. African-Americans are a somewhat admixed population, but the potential differences from this admixture would be a fraction of a fraction; probably too small to detect in this data. A prediction is that sibling differences should be larger, and color-IQ correlations stronger in biracial families. The limitations of the data do not permit knowledge of true genetic relationships, so some unknown percentage of sibling pairs with phenotypic differences could be the result of misreporting or mistaken paternity. Again, the lack of within family correlations in this data is evidence that this must not have been a significant source of bias. However, the within-family scholastic differences in the Brazilian data, discussed above, might reflect this instead of the familial color discrimination invoked by the researchers. In cases of doubt, direct genetic data is not fully necessary; predicted sibling correlations across multiple traits can be used to remove outliers and establish a sample with valid kinship. Bouchard, T.J., Lykken, D.T., McGue, M., Segal, N.L., & Tellegen, A. (1990). Sources of human psychological differences: The Minnesota study of twins reared apart. Science, 250, 223-228. Burchard, E.G., Borrell, L.N., Choudhry, S., Naqvi, M., Tsai, H.J., Rodriguez-Santana, J. R., … & Risch, N. (2005). Latino populations: a unique opportunity for the study of race, genetics, and social environment in epidemiological research. American Journal of Public Health, 95, 2161-2168. Cheng, C.Y., Reich, D., Haiman, C.A., Tandon, A., Patterson, N., Elizabeth, S., … & Kao, W. L. (2012). African ancestry and its correlation to Type 2 Diabetes in African Americans: A genetic admixture analysis in three US population cohorts. PloS one, 7, 1-9. Davies, G., Tenesa, A., Payton, A., Yang, J., Harris, S. E., Liewald, D., … & Deary, I.J. (2011). Genome-wide association studies establish that human intelligence is highly heritable and polygenic. Molecular Psychiatry, 16, 996-1005. Florez, J.C., Price, A.L., Campbell, D., Riba, L., Parra, M.V., Yu, F., … & Reich, D. (2009). Strong association of socioeconomic status with genetic ancestry in Latinos: implications for admixture studies of type 2 diabetes. Diabetologia, 52, 1528-1536. Loehlin, J.C., Horn, J.M., & Willerman, L. (1997). Heredity, environment, and IQ in the Texas Adoption Project. In R.J. Sternberg & E.L. Grigorenko (Eds. ), Intelligence, heredity, and environment (pp. 105-125). NY, USA: Cambridge University Press. Matheny Jr., A.P. (1979). Appraisal of parental bias in twin studies. Ascribed zygosity and IQ differences in twins. Acta Geneticae Medicae et Gemellologiae, 28, 155-160. Murray, C. (2005). The inequality taboo. Commentary, 120, 13-22. Plomin, R., Haworth, C.M., Meaburn, E.L., Price, T.S., & Davis, O.S. (2013). Common DNA markers can account for more than half of the genetic influence on cognitive abilities. Psychological Science, online pre-print. Rangel, M.A. (2007). Is parental love colorblind? : allocation of resources within mixed families. Working paper, University of Chicago. Scarr, S., & Carter-Saltzman, L. (1979). Twin method: Defense of a critical assumption. Behavior Genetics, 9, 527-542. Scarr, S., & Weinberg, R.A. (1976). IQ test performance of Black children adopted by White families. American Psychologist, 31, 726-739. Telles, E.E. (2004). Race in another America: the significance of skin color in Brazil. NJ, USA: Princeton University Press. Visscher, P.M., Medland, S.E., Ferreira, M.A., Morley, K. I., Zhu, G., Cornes, B. K., … & Martin, N. G. (2006). Assumption-free estimation of heritability from genome-wide identity-by-descent sharing between full siblings. PLoS genetics, 2, 0316-0325. Is Psychometric g a Myth? It’s interesting to hear about the behind-the-scenes politics of scientific research. Gregory Cochran on the Straight Dope message-board has talked about scientists initially interested in testing his hypothesis on Ashkenazi IQ being scared off from doing so due to the taboo nature of this issue. The link to Murray’s attempt to gather a team is now dead. No backup on wayback machine. Did anyone save a copy? This is why blogging as is cannot substitute for more academic publications (yet). There is a lack of permanence. Thanks for the heads up. Yahoo Groups changed their website around. I’ve updated the link. Meng Hu’s blog is no longer there. There is a copy from 2013 on the Wayback machine. http://web.archive.org/web/20131228222215/http://menghusblog.wordpress.com/2013/03/07/educability-and-group-differences-jensen-1973/ However, it is not very pretty. Never store important things on blogs you don’t have control over. Especially not about controversial topics like this. Do you take backups of the HV site? I’ve always assumed that the correlation between the measures of skin color and the estimates of racial admixture from noncoding genetic markers is well under 1. Even if it’s as high as .7 or .8, wouldn’t large enough samples enable disentangling effects of skin color and underlying genetic mix?